I had every intention of making a local dinner of Flying Pigs pork cutlets stuffed with CSA frozen arugula, Nettle Meadow chevre and Cranberry Hill organic cranberries. Tai was drooling at the mere thought. However, as the afternoon waned I realized that I was just not in the mood for meat, even though the pork was thawing away on the counter. So I stuck Flying Pigs back in the fridge for tomorrow and made the same basic flavors (and ingredients) into a savory scone instead. 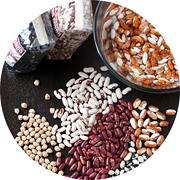 This is one of the nice things about eating locally as a habit, rather than the exception; it is easy to switch gears when you want to, and easier to put together an entirely local meal out of what is available in your larder, instead of having to shop for the ingredients for a specific recipe – and then make that recipe even if you really don’t feel like it. The ingredients in this particular scone are actually rather far-flung for me, although I still consider them “local.” Cranberry Hill organic cranberries are grown in Plymouth, MA, on Cape Cod, which Google Maps informs me is 156 miles away. Bardwell Farms in West Pawlett, NY is 153 miles away, yet I buy their cheeses at my local farmer’s market that is less than a mile away. 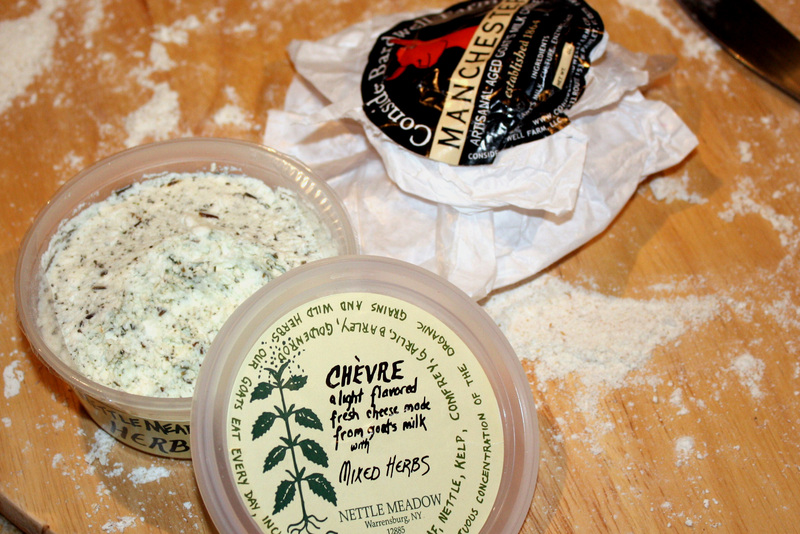 I buy Nettle Meadow chevre often, usually at my local cheese shop, Plum Plums in Pound Ridge, yet they are also about 153 miles away. I don’t think it is important to obsess about the number of miles (in fact this is the first time I’ve looked this up for any of these ingredients that I use often), but to be mindful of the fact that goat cheese from a small, organically-run farm in Vermont is likely better for me, better for the planet and better tasting than goat cheese from a mega-factory-farm in Wisconsin. It’s a fairly easy rule of thumb and perhaps an easier method for someone who is just starting to think about where their food comes from. This recipe is quite easy, as scones recipes go. The butter is replaced by cheese, so there is no cutting in or crumbling of the butter; simply grating of cheese. The tangy goat cheese, cranberries and spicy chives blended together quite nicely for a flavorful scone with a crisp outer crust. The inside was a bit less melty-cheese-goodness than in the Cheddar-Scallion version, probably due to the drier nature of goat cheese. I think heavy cream would work well in this version, or perhaps the addition of 2 or 3 tablespoons of butter in order to create a more moist center. Of course, that hasn’t stopped me from having three of them already… I think I had better finish off “dinner” with an apple and freeze the rest of them! 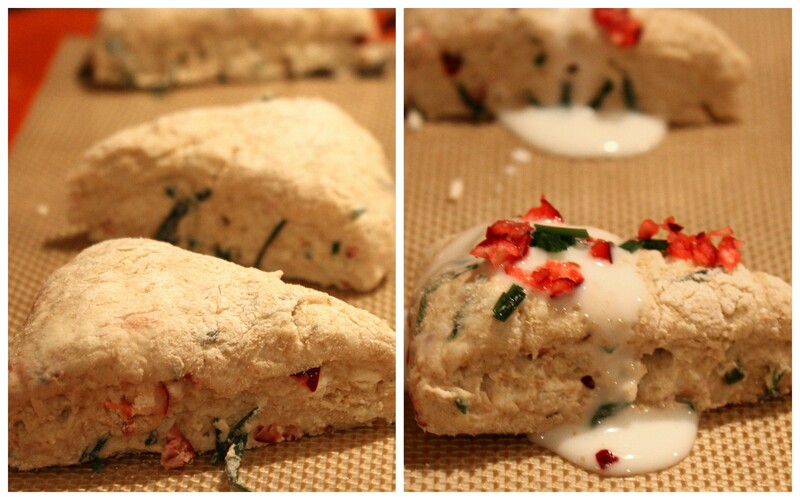 Adapted from my Cheddar Scallion Scones, which were adapted from Cheddar-Chive Scones, Gourmet, July 2000. Whisk together flours, baking powder and salt. Add chives, chopped cranberries (reserve about 2 tbsp of cranberries for topping) and cheeses and toss to combine. Add 1 cup buttermilk and toss with a fork; continue adding buttermilk until a sticky dough forms. Be careful not to add too much buttermilk; the trick to a great scone is just enough liquid & fat to make sure all of the flour is hydrated, but not so much that the dough does not hold it’s shape in the oven. Turn dough onto a lightly floured board and knead a few times with floured hands. The dough should feel dense and just slightly sticky, more dense than bread dough but not quite as dense as Play-doh. Halve the dough and form each half into a 6-inch round. Using a sharp knife (dipped in water if necessary) or dough scraper, cut each round in half, then in half again, then cut each of the 4 sections in half, resulting in 8 small scones. Transfer scones to a parchment- or Silpat-lined baking sheet, leaving at least 1-inch between scones. Using a handled measuring cup with a pouring spout, carefully pour a little buttermilk on top of the scones (this helps the chives and cranberries stick), spilling a little down the sides of each scone. 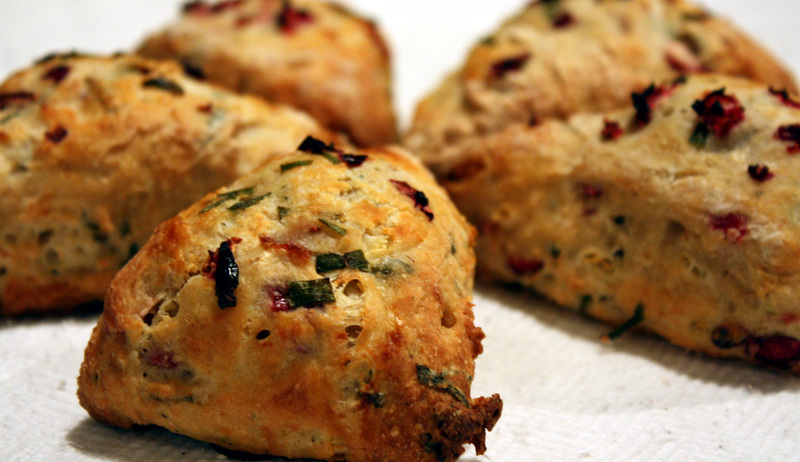 Sprinkle chives and finely chopped cranberries on top of each scone. Bake for 25-30 minutes (20-25 minutes convection), turning the pan once halfway through, until the scones are golden brown. 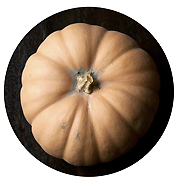 Bake directly on a pizza stone if you have one – this makes for a crispy exterior and fluffy, creamy interior. Cool on a rack for at least 5 minutes before serving. The original recipe calls for heavy cream instead of buttermilk. I like the buttermilk version better in the cheddar-scallion scones, but due to the lower fat and richness of the goat cheese, I now think that cream would have worked better. When I make these again, I’ll try heavy cream instead and post an update. This recipe can work with almost any sharpish cheese and spicy green; use what you have on hand in your local farmer’s market. I think a scone using a very soft cheese, like a brie or triple creme, would not hold it’s structure, and a scone without butter made entirely of a very hard grating cheese, like parmesean, would be too dry, but other than that, use your imagination! 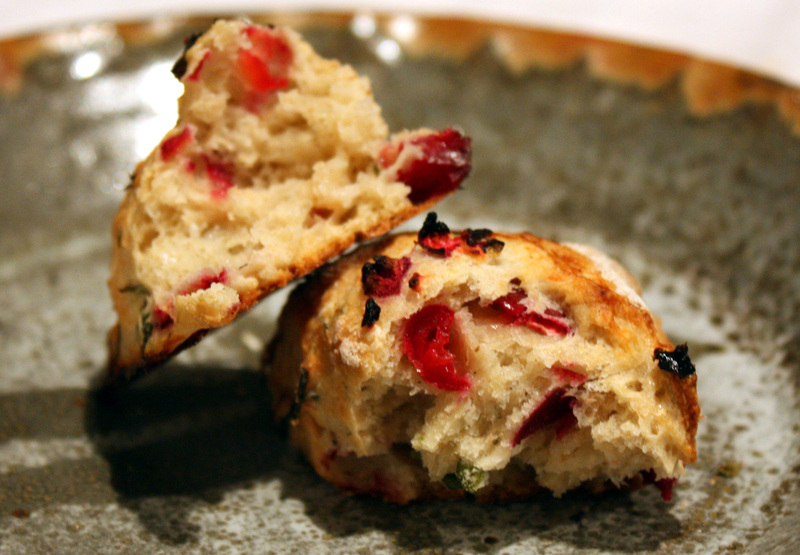 Year-round with frozen chives and cranberries, yet this seems a decidedly wintery scone with it’s red & green decor and rich, goat-cheesey, tangy flavor. 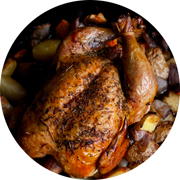 About 2 days at room temperature – do not store in plastic as they will get soggy. I keep them on cooling racks covered with a kitchen towel, or stacked in an open bowl, separated with waxed paper. Scones do not refrigerate well, as they tend to either get soggy, or dry out and get dense. They do, however, freeze well for up to 3 months; pop a frozen scone into the toaster oven for a minute or two and they are as good as fresh-baked. Those look divine! I am so grateful for Wild Hive (and Lightning Tree)! Oooooh, I haven’t heard of Lightning Tree! Where do you get it? Always great to have another source of local flour; with all the pies over the holiday, I just used the last of my whole wheat pastry flour! Lightening Tree is the farm that grows the grains. Wild Hive is the mill that makes the flours. Wild Hive also is a cafe and bakery. 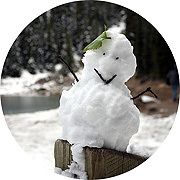 It’s a nice day trip–best to do when the (huge) Millbrook Farmers Market is in season.